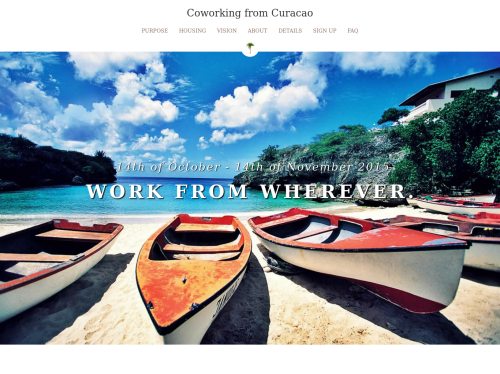 Work from Curacao: Coworking and living in the Caribbean. Coworking and living in the Caribbean. Do you work from home, a co-working space, or in coffee shops? Can you pretty much get by with a laptop and Skype? What's stopping you from working wherever you want? In October-November 2015, a group of us who work remotely are joining forces to spend one month working and living together in Curacao, The Dutch Antilles. It's neither a retreat nor a vacation, but a month long experiment in co-living and co-working a location independent lifestyle. We will live and work pretty much like we do from home, except we will live on an island, in the Caribbean, with a badass community of our peers. Who? We are a diverse group — entrepreneurs, authors, Ph.D. candidates, independent consultants, yogis, and a couple people who just need a good sabbatical -- and we all strive to balance work and life and live to our fullest potential as global citizens.